Kate pays sartorial tribute to India yet again with £3000 ensemble | HELLO! The Duchess of Cambridge, née Kate Middleton, is known for her diplomatic dressing. But the royal has really stepped up her thoughtful sartorial tributes for her tour of India so far. After paying tribute to the country with three different outfits on Sunday, the stunning brunette has impressed fashion fans yet again with another Indian-inspired outfit. Stepping out for a garden party in Delhi to celebrate the Queen's 90th birthday, Kate looked typically stylish in an Alice Temperley crop top and skirt ensemble. 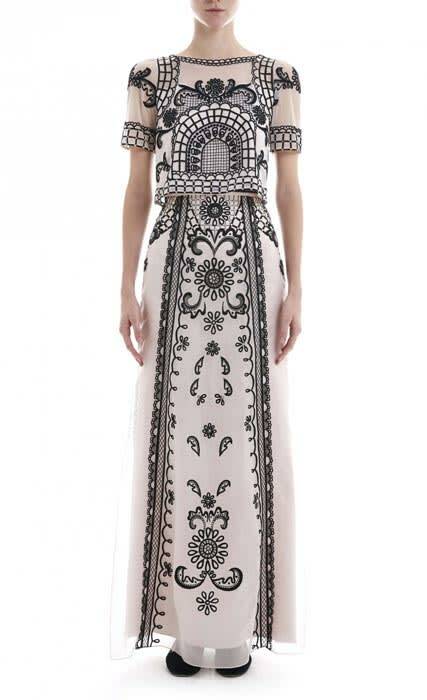 The black and white outfit, titled Delphia, featured opulent embroidery motifs of Indian Chintz and lattice. The top costs £995, while the skirt has a price tag of £1,995. Kate's sartorial nod comes just one day after her trio of thoughtful ensembles. Kicking off the tour, the 34-year-old wore a eye-catching peplum blouse and skirt design from Alexander McQueen. While the fashion house is British, the outfit still gave a nod to India with its traditional tear drop-shaped print. Kate later slipped into a mid-length pink and green chiffon dress by Mumbai designer Anita Dongre. An aide revealed that the Duchess was keen to fly the flag for local fashion during the trip. "She wanted to wear a local designer at the earliest possible opportunity," they said, adding that the choice of dress was "a tribute to Mumbai’s wonderful design talent." To round off the busy day, Kate attended a Bollywood gala. And the royal far from disappointed, dazzling in a royal blue gown by her favourite designer Jenny Packham. The royal gave another nod to her host country - the blue floor-length evening gown featured intricate beading that had been carried out in India. Which colour will the Queen wear for her 90th birthday celebrations?